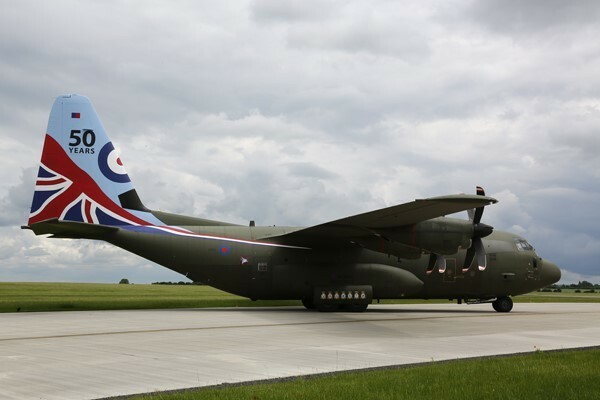 Marshall Aerospace and Defence Group is celebrating 50 years of supporting the United Kingdom’s Royal Air Force’s fleet of Lockheed Martin Hercules C-130s. The fleet of 24 C-130Js is currently maintained under the innovative Hercules Integrated Operational Support (HIOS) programme, which debuted in 2006 and focusses on meeting the RAF’s immediate and long-term operational capabilities, through maintenance and upgrades to improve front line availability. Air Cdre Steve Lushington, Royal Air Force’s Air Mobility Force Commander, commented: “The C130 has been the mainstay of the Royal Air Force’s air transport fleet for five decades. The first Royal Air Force Hercules first flew in 1966 and entered service with 242 OCU, Royal Air Force Thorney Island, on 1 August 1967. Throughout its service career, Royal Air Force Hercules aircraft have been ever-present on operations, performing vital roles both in the UK and overseas. During the last five decades, Marshall has worked on more than 90 C-130s for the RAF, performing both standard and deep maintenance, as well as special mission modifications. In addition, Marshall’s relationship with the RAF’s forebear, the Royal Flying Corps, dates back to 1912. Marshall’s C-130 engineering and project management skills were demonstrated in 2013, when the company quickly returned to service five aircraft based at Kandahar, Afghanistan, when they suffered severe hailstone damage. In recognition of the rapid response, the RAF awarded Marshall a Chief of the Air Staff’s Commendation. Marshall has supported the C-130 in 33 countries for 52 customers, and has worked on more than 300 aircraft.